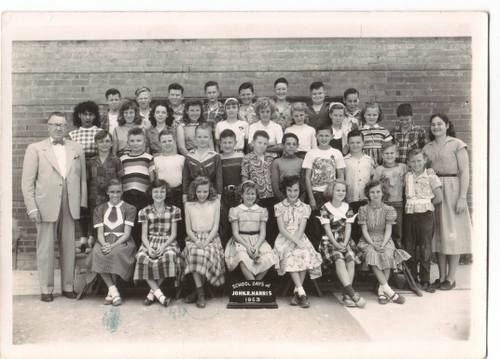 Linda Little Strickland sent an e-mail saying that John Echoff appealed to her to identify their classmates in the photo he submitted. This is what she contributed, with a few additions that John submitted as well. It was the 5th grade, Miss Lewis is the teacher. Row 1 from left,1. Trudy Williams 2.Nancy Grey, 3. Mary Beth? (John says it's Mary Margaret Baker), 4.?, 5.Melba Frazier,6.Betty?, 7. Carolyn Mantooth. Row 2 from left 1.Ralph Hester, 2 Barry Owens,3 ?, 4.Bobby Padgett, 5?, 6. John Echoff, 7. James Bearden, 8. Lynn Williams, 9.Roy Johnson, 10 A.L. Elliott, 11. Curtis Barker Row 3 from left 1. Tonie?, 3. Carolyn Sayers, 4.?,5.?,6. ?,7.Linda Little, 8.Bessie Davis, 9.Beverly Frankinson, 10.?. Row 4 from left. 1. Milton Wright, 2.?, 3. Billy White (John says Roy Lee White), 4. Butch Maddox, 5.Norman?, 6.Billy Stidham,7. Bobby Pollard, 8.? Linda did not identify, but I think that must surely be Beverly Frankinson on the 3rd row, 2nd from right. Am I correct?? ?